The biological landscape has been transformed by the sequencing of genomes, and more recently by global gene expression analyses using microarrays [1, 2]. Microarrays contain DNA probes representing all coding sequences in a genome, which are either synthesized in situ or are spotted onto a modified glass surface . Comparison of mRNA from two conditions by competitive hybridization to these probes is used to identify differentially expressed genes . In the case of spotted microarrays, these are performed either with labeled cDNA prepared from separate mRNA preparations co-hybridized to the same array, or as is increasingly the case, by employing genomic DNA (gDNA) as a standard reference . In the latter case, each cDNA preparation is hybridized separately alongside a gDNA reference and differential expression is determined using a ratio of ratios. The use of gDNA corrects for most spatial and spot-dependent biases inherent with microarrays, and also allows direct comparison between multiple datasets . These are sometimes called type 2 experiments, with RNA:RNA hybridizations being type 1 . Traditionally, microarray experiments focus almost exclusively on changes in gene expression, and in the case of a type 1 experiment this is the only possible interpretation. Focusing on changes in expression has helped to direct us toward genes that warrant further investigation; however, it has been shown in recent meta-analyses that up-regulated genes may bear little correlation to other measures of biological importance [6–8]. One reason for this lack of correlation is that, in a traditional microarray experiment, absolute levels of mRNA are not considered; thus, no difference is reported between a gene where expression increases from 20 to 100 copies and one where it increases from 20,000 to 100,000 copies, yet the biological inference may be very different. Furthermore, all genes whose level of expression does not alter significantly between conditions are completely ignored and we do not know if they are constitutively off or on (and if so, at what level). Differential expression analysis thus provides us with an incomplete view of the transcriptome, whereas the determination of global mRNA levels could, in part, address this. Global mRNA abundance analysis is particularly applicable in prokaryotes, where, in contrast to the situation in eukaryotes, transcription and translation are tightly coupled [9, 10]. In prokaryotes, therefore, absolute mRNA levels might be expected to accurately predict levels of protein. In support of this, it has been shown in both Escherichia coli and Mycobacterium smegmatis that the most readily detectable (and hence most abundant) proteins correspond to genes with high transcript levels [11, 12]. Also, in experiments where transcriptomic and proteomic data were compared, for the majority of genes, changes at the transcriptional level were mirrored at the protein level [13, 14]. Furthermore, a comprehensive study of mRNA and protein levels in a sulfur-reducing bacterium identified a modest global correlation between the two but found that the majority of the variation could be attributed to errors in the protein analytical techniques, indicating the actual correlation could be much stronger . Surprisingly, the study of absolute levels of mRNA on a global scale has largely been ignored, despite attempts that have been made to extract meaningful quantitative information from microarrays. These include spiking various control samples of known concentration into the hybridization mixture [16, 17], and using synthesized oligos complementary to every spot on an array at a known concentration as a normaliser . Another recent report described the use of the Affymetrix gene chip platform to provide a quantitative view of gene expression levels in prokaryotes . These approaches are often impractical or, especially with commercial systems, prohibitively expensive. Type 2 experiments performed on spotted arrays on the other hand, which use gDNA as a reference, are already routinely being performed, require a minimal cost increase and could allow us to study the relative abundance of each mRNA species  in parallel with traditional fold expression analyses. Here we have focused on the determination of genome-wide mRNA levels of M. tuberculosis using type 2 microarrays for which we had a large number of datasets available. We have developed and validated the approach, characterized the genes whose level of expression is the highest in the transcriptome in vitro and those whose level of expression remains consistently high across a variety of environmental conditions. In addition, we have coupled genome-wide levels of mRNA abundance with a functional classification system in order to develop ways of understanding an organism's biology without comparison to another growth condition. Genome-wide transcriptional analyses have until now focused almost exclusively on differential expression. Methods that have been developed to quantify absolute mRNA abundances have largely been ignored or proved impractical. However, the use of gDNA as a reference channel in traditional microarray experiments is increasingly common , and as this is equivalent to an equimolar concentration of all transcripts we have investigated using this as a normaliser that would allow us to generate a measure of genome wide mRNA abundances. Initially we calculated relative mRNA abundances for M. tuberculosis growing aerobically in chemostat cultures as we had access to the RNA used for hybridization to the arrays, allowing us to experimentally validate our analysis. RNA and microarray procedures were carried out as described in the Materials and methods and . To obtain a measure of mRNA abundance, we first removed the local background fluorescence from each probe spot on the microarray. The fluorescence intensity from the RNA channel was then normalized to that of the gDNA channel, after which the technical and biological replicates were averaged. We then found it necessary to correct for a probe length effect present in the data. In a traditional microarray (type 1) experiment, comparisons are made between two cDNA populations hybridized to one spot. Although in most cases it is necessary to control for factors such as the spatial dependent effects of hybridization, and normalizations such as loess are routinely implemented for this purpose , it is not necessary to control for individual spot variations as these would be negated when calculating fold expression ratios. In our case, where we are attempting to draw comparison between signals generated from different spots on the array, we are faced with additional factors that could introduce bias to our results - those that differ between spots on the array, for example, the probe GC content and length. Using the signal reported from a gDNA hybridization, we investigated these factors. We found that the length of the probes, which ranged in length from 60 to 1,000 bp, affected the hybridization whereby longer probes report higher signal intensities (Figure 1a). We suspect this may be because larger probes are able to bind more DNA and bind it more strongly than shorter probes. We corrected for this effect using a model of linear regression (Figure 1b; and see Materials and methods). Probe length normalization and quantified gene expression levels in M. tuberculosis. (a) We found that longer probes correlated with increased fluorescent intensities, which then biased the ppm values we obtained. (b) We are able to remove this bias using a model of linear regression. The three distinct groupings visible in the figure are an artifact of the probe lengths targeted during their synthesis by PCR. (c) The level of expression for each gene in the genome, as determined by our analysis from chemostat grown wild-type M. tuberculosis H37Rv, is shown ordered as they appear in the chromosome. (d) The log frequency distribution of mRNA abundances from (c). A clear skew to the right, containing a subset of very highly expressed genes, is typical of the distributions we have found. Finally, as the sum of all fluorescence intensities is equal to the sum of all labeled mRNA, the measures of mRNA abundance were converted from unintuitive ratios to a proportional value; parts per million (ppm). Table 1 shows the mRNA abundance values for the 50 most highly expressed genes of M. tuberculosis. Figure 1c shows the mRNA levels, in ppm, for each gene in the M. tuberculosis chromosome and their log distribution is shown in Figure 1d. It is clear that the mRNA abundances, even once log transformed, are not normally distributed, which reflects the observations of others . *Essential genes (TraSH) [26,27]. †Surface polysaccharides, lipopolysaccharides, proteins and antigens. ‡DNA replication, repair, recombination and restriction-modification. In order to validate our estimates of abundance, we performed quantitative reverse transcriptase PCR (RTq-PCR) on a large selection of genes that we had predicted to span the mRNA abundance spectrum (n = 24). The RTq-PCR was carried out on a sample of the same RNA used for the microarray hybridizations. 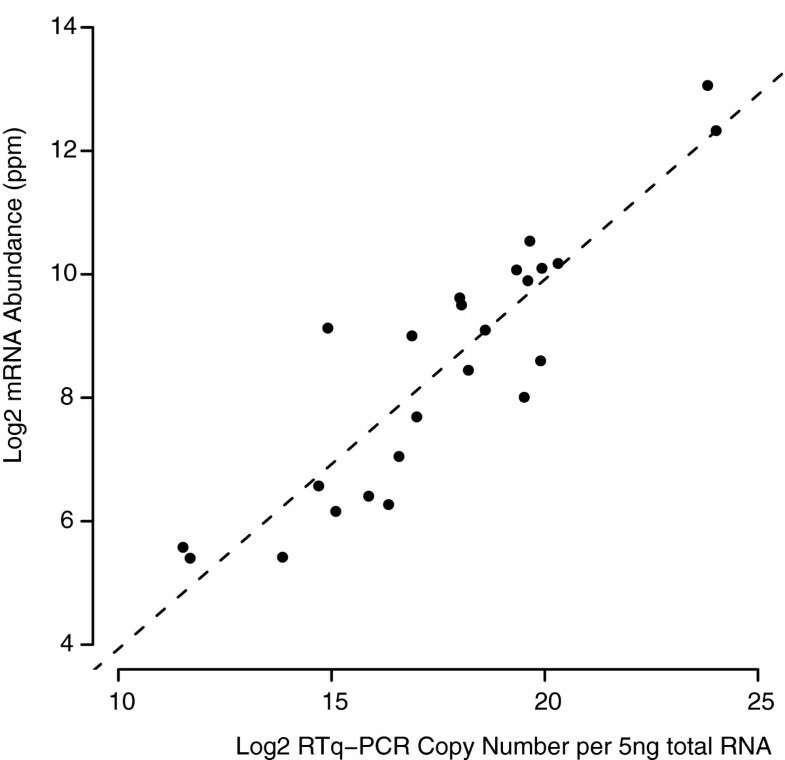 The measures of mRNA abundance as predicted from the microarray analysis show a good correlation (Spearman's rank = 0.86, p < 0.0001) with the absolute copy number as determined by RTq-PCR data (Figure 2). Microarray analysis validation. There is a strong correlation (0.86, Spearman's rank, p < 0.0001) between mRNA levels as predicted by our microarray analysis and mRNA copy number as determined by RTq-PCR. Further validation of the method was provided by its high reproducibility when applied to data sets from independent laboratories using the same microarray designs. Correlations were determined for a variety of mRNA abundance data from both M. tuberculosis and the highly similar Mycobacterium bovis . Chemostat-grown M. tuberculosis showed a correlation of 0.8 (p < 0.0001) with the homologous genes in chemostat-grown M. bovis. The same was true of batch-cultured M. tuberculosis and M. bovis grown in different institutions. However, there was a lower correlation of 0.5 (p < 0.0001) between chemostat and batch cultured M. tuberculosis from different laboratories, suggesting that the method of culture significantly affects the transcriptome. 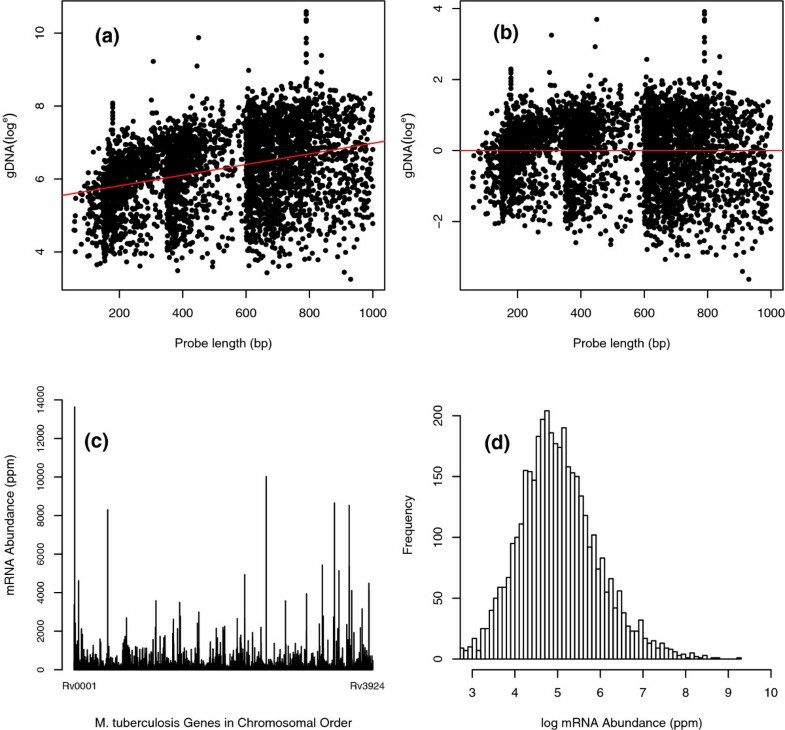 To explore the possibility that global measures of mRNA abundance are an important indicator of prokaryotic biology, we compared our mRNA abundance data with proteome and gene essentiality data. Demonstrating a correlation between mRNA and protein levels is difficult without the availability of genome-wide measures of protein abundance. We looked instead at the list of M. tuberculosis proteins identified to date from two-dimensional PAGE analysis and stored in an online database . As the mRNA abundances are not normally distributed, we determined the frequency of identified proteins in each quartile of the abundance distribution. Of the 283 unique proteins identified in M. tuberculosis cell lysates and supernatants, the majority (187 proteins, 66%) are expressed in the most abundant quartile (Figure 3a). Others have suggested that proteomic experiments have an intrinsic bias toward abundant proteins [12, 25] and this would support our hypothesis that the most abundant transcripts produce high levels of protein in bacteria. In addition, our analysis makes no allowance for differential rates of translation initiation or mRNA/protein degradation, so this finding reflects how tightly coupled the systems of transcription and translation are in prokaryotes [9, 10]. Correlations between mRNA and biological importance. (a) Proteins identified by two-dimensional PAGE/MS  correlates with the most highly expressed genes (Chi-squared test for trend in proportions = 251.9, df = 1, p value < 0.0001). (b) Similarly, there is a significant relationship between expression level and essentiality as determined by TraSH [7,26,27] (Chi-squared test for trend in proportions = 161.2, df = 1, p value < 0.0001). As there is little correlation between reports of biological importance and gene induction [6–8] we instead looked at the correlation with mRNA abundance. We compared the genome-wide values of mRNA abundance with the genes identified as being essential in M. tuberculosis by genome-wide transposon mutant library (TraSH) screens [7, 26, 27]. For our RTq-PCR validated data from M. tuberculosis growing under aerobic chemostat conditions we found that there is a significant relationship between expression level and essentiality on a global scale (Chi-squared test for trend in proportions = 161.2, df = 1, p value < 0.0001; Figure 3b). This is in contrast to the lack of correlation with fold-induction upon infection [6, 7] and illustrates the potential importance of determining mRNA abundances on a global scale. The correlation may reflect our previous finding that the more highly expressed a gene, the more protein is produced. Although there are obvious examples where proteins with essential functions, such as the cell division apparatus or many enzymes, need not be (or indeed cannot be) highly expressed , prokaryotic cells would waste considerable energy synthesizing large amounts of proteins that do not have essential functions. The genome-wide distribution of mRNA levels from M. tuberculosis cultured aerobically in the chemostat is typical of the distributions we have found (Figure 1d). Despite being log transformed, the distribution shows a skew to the right, suggesting the presence of a highly expressed subpopulation. As we and others have shown, the coupling of transcription and translation in prokaryotes means that there is an enormous material investment in transcribing a gene at a high level. We therefore analyzed the most abundant mRNAs in some detail, focusing on the 95th percentile of genes, that is, the 5% most abundant transcripts, n = 198 (Additional data file 1). 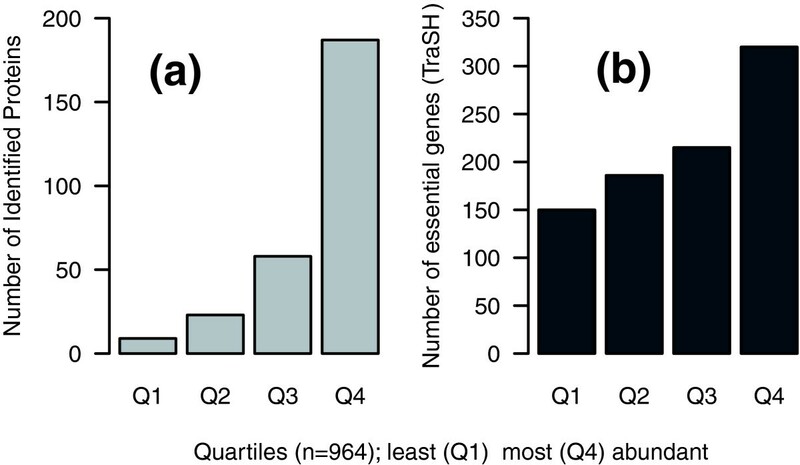 Of these 198 genes, 89 (45%) were reported as essential in the TraSH experiments, which is significantly higher than the 23% of all genes that are essential (Χ2 p < 0.001). Of the 89 essential genes, 76 (38%) were essential in vitro, 11 (5%) in vivo and 2 (1%) are essential for survival in macrophages [7, 26, 27]. The most highly expressed gene in vitro was ppiA (Rv0009), a probable peptidyl-prolyl cis-trans isomerase involved in protein folding, which makes up 13,634 ppm (which is equivalent to 1.3%) of the total mRNA population. As would be expected, many of the very abundant transcripts belong to the protein synthesis machinery, including thirty ribosomal proteins, six translation initiation factors and various components of RNA polymerase. Several of the very abundant genes have previously been characterized as highly expressed and extensively documented as important virulence determinants of M. tuberculosis. In particular, some members of the esx gene family have been shown to be critical in infection, although dispensable in vitro. The paradigms for this family are esat6 (Rv3875) and cfp10 (Rv3874), whose products form a secreted complex that interacts with host cells . Furthermore, they are potent immunogens with potential roles as both subunit vaccines and diagnostic agents [30, 31]. The esx family in M. tuberculosis contains 23 esat6-like genes, with 11 esat/cfp gene pairs . Including esat6 and cfp10, we identified 12 members (52%) of this family as being amongst the most highly transcribed of all genes. One such pair of genes, esxV (Rv3619c) and esxW (Rv3620c), are adjacent to, but not transcribed with, the SNM (secretion in mycobacteria) operon containing Rv3616c (espA), Rv3615c (snm9) and Rv3614c (snm10), which we also find are very highly expressed. Two groups have recently shown that the SNM system functions to export both ESAT-6 and CFP-10 [33, 34]. We have also observed five highly expressed transcripts belonging to the PE/PPE family; a set of approximately 100 genes encoding proteins with proline and glutamate rich motifs that are found exclusively within the mycobacteria . Some members of this family are located adjacent to esx genes, suggesting a functional association, and it is now known that a PE/PPE pair form a stable dimer, reminiscent of ESAT-6/CFP-10 themselves . Of the five PE/PPE genes in our very abundant transcript list, two are located adjacent to highly expressed esx family gene pairs: PPE18 (Rv1196) with esxKL (Rv1197/Rv1198), and PE19 (Rv1791) with esxMN (Rv1792/Rv1793). The significance of linked high expression levels between esx and PE/PPE genes suggests a co-functionality critical to M. tuberculosis biology. Thirty-three percent of the coding sequences in M. tuberculosis were classified as having no known function in a re-annotation of the genome . A similar proportion (60 of 198, 30%) of the transcripts we have classified as very abundant in M. tuberculosis are annotated as unknown, hypothetical or conserved hypothetical proteins. The organism consumes considerable energy in their expression so it is likely they have important functions, and indeed 12 of these unknown genes are essential. Using both BLASTP and functional predictions generated with the hidden Markov model profile tool SHARKhunt , we were unable to ascribe any further functions to these genes with the exception of Rv0097, which has close homology to a taurine dioxygenase of the Streptomyces, Ralstonia and Chromobacterium species. It has been reported  that the Rv0097 homologue in M. bovis is located in an operon essential for the synthesis of the virulence associated lipids phthiocerol dimycocerosate esters (PDIMs) and could function as an α-ketoglutarate-dependent dioxygenase, the super family to which taurine dioxygenases belong. Much effort goes into looking for genes whose expression is modulated in different environments. Although it is likely that most, if not all, genes are regulated to some extent, using the analysis described here it is possible to search for genes whose expression does not change significantly, which we term 'invariant'. These may represent genes whose functions are so important that they cannot be switched off. To identify these invariant genes, we compared the mRNA abundance in a total of six data sets including various growth conditions, such as chemostat, batch culture, low oxygen and growth in macrophages. We focused on genes that were within the 85th percentile and found that 133 genes were consistently highly expressed across all of the conditions tested (Table 2). Using our measure of absolute mRNA levels, we have been able to identify the genes whose level of expression remains consistently high across a variety of growth conditions. These genes remain amongst the top 15% most highly expressed genes across all of the conditions tested. We have termed the genes whose level of expression does not vary greatly as invariant, and, therefore, the subset of genes included in this table is dubbed the 'abundant invariome'. Notable members of this abundant invariome include several esx-related genes (esat6, cfp10 and the SNM secretion system), the paired PE31 and PPE60, groEL2 (the 65 kDa antigen) and the ATP synthase operon (atpA-atpH). Compared to a global 23% of genes that are essential, 53% (70 of 133, Χ2 p < 0.001) of the genes in the abundant invariome are essential for either in vitro growth or survival in mice or macrophages [7, 26, 27]. Twenty-two of our abundant invariome genes have no known function, two of which (Rv0289 and Rv1303) are essential. These and other members of the abundant invariome are primary candidates for future functional studies that may elucidate key mycobacterial biology. As well as an obvious hypothesis generation role, such invariant gene analyses might have uses, for example, in identifying strong antigens, constitutive promoters and stable housekeeping genes expressed in all environments. Furthermore, as significant proportions of the abundant invariome are essential, this analysis also has the potential to identify drug targets or candidate virulence factors in prokaryotes even if no other biological information is known. The advent of systems biology is encouraging the development of techniques that reveal more holistic information about biological systems. We have therefore combined our measures of M. tuberculosis mRNA abundance with a non-overlapping classification system based on known or predicted functions [40, 41]. Not only does this accord with the aims of systems biology, it would also remove the need to routinely compare expression profiles to that of artificial laboratory conditions and could, therefore, be more biologically meaningful. Using this analysis to study the transcriptome of M. tuberculosis in a disease relevant  low oxygen state (chemostat grown at a dissolved oxygen tension (DOT) of 0.2% ) reveals that, at the broadest scope of the classification system, 29% of the mRNA in the transcriptome codes for proteins involved in small molecule metabolism, 19% for macromolecule metabolism, 7% for 'other' functions (virulence, and so on) and 7% for cellular processes. In addition, 38% of the in vitro low oxygen transcriptome codes for proteins of unknown function, illustrating how little of mycobacterial biology has been characterized to date. To determine which functional classes, at all levels of the classification system, were significantly over- or under-represented in the transcriptome, we chose, for comparison, three different robust and nonparametric approaches: robust linear modeling, bootstrap-t using the Q statistic of Davison and Hinkley , and a bootstrap-t using trimmed means and winsorized variances . We removed all classes with fewer than four data points to be able to obtain variance estimates after trimming. As an example of how this might be used, we again focused on the low oxygen transcriptome. In this example, many of the functional classes that we have shown to be significantly over-represented within the transcriptome by all three tests reflect the growth rate in the chemostat (maintained at a 24 hour doubling time ), including the protein translation machinery, the chaperones, the RNA and DNA synthesis mechanisms, and the ribosomal proteins (Additional data file 2). Also abundant are classes involved with energy metabolism, including ATP synthesis and the TCA cycle, as well as macromolecule synthesis, including the fatty and mycolic acid anabolic pathways. Using either of the bootstrap-t methods appears to be too stringent to reveal classes that we would immediately recognize as reflecting the adaptation to low oxygen. However, the classes deemed significant by the robust linear modeling method include the glyoxylate shunt enzymes, which are essential in vivo for the anaplerosis of acetyl-CoA when growing on fatty acids [45, 46], and the oxidative electron transport system known to operate under reduced oxygen tensions in mycobacteria . Our functional analyses are only preliminary; we are limited by the lack of a comprehensive bacterial gene ontology. However, we suggest that this is a biologically relevant approach that could be expanded and used to identify the key cellular and metabolic processes required by an organism in a particular growth condition. It will link well with other systems biology analyses to produce useful insights into bacterial physiological states and, for example, could be used to determine the processes, rather than the components, required for infection and latency in M. tuberculosis. We have developed a method of microarray analysis that quantifies levels of mRNA on a genome-wide scale. Our method of analysis can be applied to any spotted microarray data set produced using gDNA as a reference channel. Applying this analysis to the prokaryote M. tuberculosis, we have identified the most highly expressed genes and note correlations with gene essentiality as well as with a basic measure of protein abundance. We have also been able to define the subset of genes that are invariantly highly expressed and find that more than half are essential for growth in vitro or survival in vivo. In addition, we are also able to produce a functionally organized holistic view of the transcriptome. Alongside traditional changes in expression, mRNA abundance analysis can, therefore, greatly enhance the utility of microarray data and has numerous additional uses that will aid genetic research into prokaryotic organisms. Six microarray datasets have been used in this study (Table 3). The microarrays used for hybridization were the BμG@S TB version 1 arrays (Array Express accession: A-BUGS-1) , for data sets 1 to 3, containing 3,924 spotted PCR products and TB version 2 arrays (A-BUGS-23) , for data sets 4 to 6, containing 4,410 spotted PCR products, including additional open reading frames from M. bovis strain AF2122/97. Fully annotated microarray data have been deposited in BμG@Sbase (accession number E-BUGS-60)  and also ArrayExpress (accession number E-BUGS-60). Batch cultures of M. tuberculosis and M. bovis were grown in 100 ml Middlebrook 7H9 (Becton, Dickinson and Co. Franklin Lakes, NJ, USA) supplemented with 10% Middlebrook OADC (Becton, Dickinson and Co.) in 1 liter capacity flasks that were continuously rolled at 37°C. Chemostat cultures, RNA extraction and microarray hybridizations were performed as detailed in Bacon et al. 2004 . Briefly, 500 ml cultures were grown to steady state conditions in 1 liter chemostat fermentation vessels maintained at 37°C, with a pH of 6.9 and a generation time of 24 hours. Aerobic cultures were kept at a DOT of 10% whilst low oxygen cultures were maintained at 0.2% DOT. Aliquots of the bacterial cultures (10 ml) were sampled directly into four volumes of a guanadinium thiocyanate based stop solution. After centrifugation and resuspension in either Trizol (Invitrogen, Carlsbad, California, USA) or additional stop solution, cells were lysed using a Ribolyser (Hybaid, Teddington, England) or Precellys 24 (Bertin Technologies, Montigny-le-Bretonneux, France) and RNA was extracted using a chloroform precipitation followed by purification with the RNeasy Mini Kit (Qiagen, Hilden, Germany). RNA was then treated with deoxyribonuclease (DNase 1 amplification grade, Life Technologies Inc/Invitrogen, Carlsbad, California, USA). Genomic DNA was isolated from pellets of stationary phase mycobacterial cultures following previously described procedures . For the majority of the datasets RNA was extracted from four independent biological replicates and each was labeled in triplicate using 8 μg total RNA as a template for reverse transcriptase (Superscript II RNAse H, Life Technologies Inc.) in the presence of random primers (Invitrogen, Carlsbad, California, USA) and Cy5 labeled dCTP. Genomic DNA (1 μg) was used as a template for DNA polymerase (Klenow, Invitrogen, Carlsbad, California, USA) in the presence of random primers and Cy3 labeled dCTP. Purified Cy3/Cy5 labeled DNA were combined and added to the array underneath a cover slip before being sealed in a hybridization chamber and submerged in a water bath at 65°C for 16-20 hours. Scanning was performed with a dual laser scanner (Affymetrix 428, MWG Biotech, Ebersberg, Germany) at a gain below saturation of the most intense spots. Both spot and local background levels were quantified from the resulting images using ImaGene 4.0 (MWG Biotech). The Perl computing language and the R statistical environment  were used to perform all data and statistical analysis. The YASMA  microarray analysis package for R was used to input and structure the raw data. Initially, all control spots on the array were removed from the dataset, including all representing ribosomal RNA. The local background noise, as determined by the image quantification software, was subtracted from each spot. No data values were excluded from this study as we reasoned weak signals (after background subtraction) were reflective of low abundance transcripts. The correlation between hybridization replicates within each dataset was confirmed to ensure there were no extreme outliers. Technical and biological replicates were then averaged to provide a single normalized intensity value for each gene on the array. To assess if the measures of transcript abundance from the array analysis truly reflect that of the RNA sample we carried out RTq-PCR on 24 genes predicted to span the spectrum of mRNA abundances as determined by the mRNA abundance analysis. The RNA samples used were those extracted and used for the microarray hybridizations in data set 1 . Total RNA (400 ng) was reverse transcribed using Superscript Reverse Transcriptase III (Invitrogen) according to the manufacturer's instructions. cDNA (5 ng) was subsequently used for RTq-PCR using the DyNAmo SYBR green qPCR kit (Finnzymes, Espoo, Finland), according to the manufacturer's instructions, in a DNA Engine Opticon 2 thermal cycler (MJ Research, Waltham, MA, USA). For each reaction a set of gDNA standards of known copy number were used to produce a standard curve from which a copy number could accurately be determined. The data were analyzed using Opticon Monitor v2.0. The genes of M. tuberculosis were grouped based on a Riley-like classification system obtained from the Sanger Institute . The classification system is non-overlapping and hierarchical, and thus has six highest level functional categories: small-molecule metabolism, macromolecule metabolism, cell processes, other, conserved hypothetical and unknowns, each of which splits into more specific subcategories. In total, 3,925 genes are classified in this system. We were looking to compare the level of expression in each functional class with that in other classes to discover which classes might be over- or under-represented within the transcriptome. We used ANOVA based approaches to detect functional classes that show significant over- or under-representation compared to the rest. We estimated location parameters for the log ppm values for each class and assessed the statistical significance of the contrast of a location parameter for a particular class and the average of location parameters for all the other classes. As seen in Figure 1d, the mRNA abundances are not normally distributed even after log-transformation, so we could not assume that the distribution of abundances within each class would be. Moreover, the variances changed considerably between functional classes. We therefore chose three different robust and nonparametric approaches to estimate the location parameters and to establish significance of contrasts: robust linear modeling; a bootstrap-t using the Q statistic of Davison and Hinkley ; and a bootstrap-t using trimmed means and winsorized variances . We removed all classes with fewer than four data points to be able to obtain variance estimates after trimming. For the robust linear model we used the rlm function from the R package MASS , with Huber's Psi function and default settings. In the bootstrap-t with Q values as pivot we trimmed points with their robustly estimated residues in the top 20% and bottom 20% quantiles before performing the bootstrap analysis to protect the estimations against outliers. For the second bootstrap-t we used trimmed means with 20% of the lower and 20% of the upper quantiles removed, corresponding to 20% winsorized variances for the pivot. Resampling was done within each functional class, since we take them as fixed effects. We collected 10,000 bootstrap samples to allow for multiple testing correction. The method of Benjamini and Yekutieli  was used to calculate a false discovery rate allowing for dependencies between functional classes. The results from all tests are provided as supporting information (Additional data file 2). Classes were considered significantly different from others if the adjusted p value was less than 0.05. The following additional data are available with the online version of this paper. Additional data file 1 is a table listing the 198 genes of the 95th percentile; the very abundant transcripts in M. tuberculosis. Additional data file 2 is a table that includes the quantified level of each functional category and details of those deemed significantly more or less abundant in the low oxygen transcriptome, including data from the three approaches to assess significance. BS is funded by a Royal Veterinary College scholarship. MW is funded by the EU MM-TB STREP grant no. 012187. SLK and AtB are supported by Wellcome Trust grants 073237 and 081455. We acknowledge BμG@S (the Bacterial Microarray Group at St George's, University of London) and The Wellcome Trust for funding the multi-collaborative microbial pathogen microarray facility under its Functional Genomics Resources Initiative. BS, LW and NS designed the research; BS, MW and LW performed the research; SLK, RAC, RF, AMCtB, SW, JH, PG, FM, and JB contributed reagents or data to this study; BS, LW and NS wrote the paper.